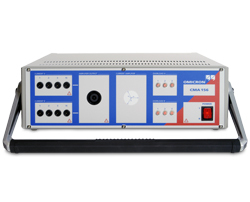 CMA 156 amplifier units can be used in combination with any CMC test set or in conjunction with digital real time power system network simulators. The outputs are galvanically separated from the inputs as well as from ground and are used independently or in addition to those of the CMC test sets. The CMA 156 contains six independent current channels, arranged in two isolated groups (A, B). The outputs can be configured in various ways (connected in parallel, in series, etc.). For example, by using four CMA 156 units, 3 x 200 A can be generated. The connection to a CMC test set is made by a control cable at the back of the units.